As some of you may know because you were there, I did a talk a while back about some work in Engage which involved machine learning. As it had been quite a while since the last time I’d given a presentation (I think it was for my dissertation), I thought I’d write a little bit about how it went, and about what I would do next time to make it better. Big thanks go to Chris, who gave some great advice on how to structure the presentation (and also a very catchy title) and to Tiff who was a big help with getting some lovely looking images together. I tried to make the presentation as light as possible, rather than going into the nitty gritty details of the machine learning process and mainly describing the problem, and the rough approach to the solution. Overall I thought it went pretty well, and most of the people that were there told me it was engaging and informative, which is always good to hear. There were a few small hiccups with the presentation itself — someone pointed out a graph having multiple time points which were the same, and the transitions didn’t work because of the projector we were using which was a shame because I’d spent quite a bit of time trying to get the perfect curve on a tumbleweed. There were some interesting and challenging questions asked afterwards, people were particularly interested in knowing about how to use the neural network the other way around – to show what was the best time to tweet. That all depends on who it is tweeting, and I’m hoping to give some more insight into that via Engage over the next few months. I think it’s important to make sure you seem at ease when giving a presentation, obviously it’s different to get to that point for different people but I’ve found that being well prepared beforehand is a big help. Being meticulous with graphs and pages is important because if someone picks up on something wrong, it is rather embarrassing. Keeping the talk quite light was good, because there was a mix of people at the talk with different levels of interests in machine learning and I think I will do the same again if it is a mixed audience. As I mentioned in the presentation the code for the neural network library that I wrote is available from github, so feel free to use it. If you want any help or have any pointers then I’d love to hear from you. 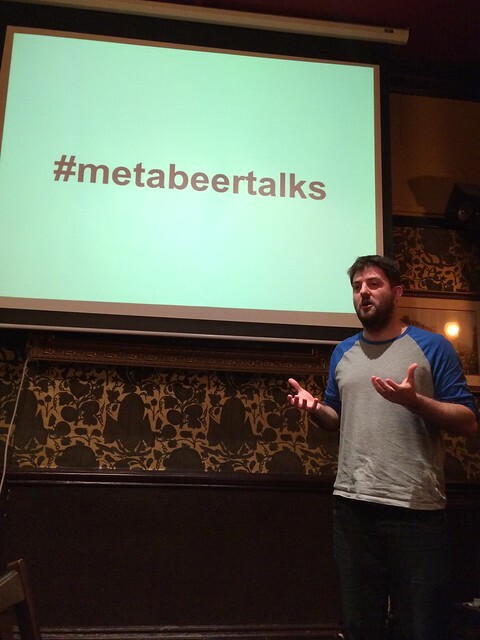 If you enjoyed the #MetaBeerTalks you will be pleased to know that there will be another one on the 16th of April, so come along!